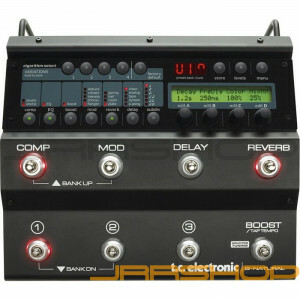 World’s first multi-effects processor for the serious acoustic guitar player. With G-Natural you no longer have to put your guitar sound in the hands of the sound engineer or to put up with effects designed for electric guitars to boost your performance. It goes without saying that effects for electric instruments do not take the construction of a hollow body acoustic guitar into account. G-Natural houses a suite of high quality effects fine-tuned for acoustic guitar. It’s all you will ever need to cut through to your audience: Compression, EQ, Boost, Modulation (Chorus, Detune, Thicken, Flange, Panner, etc. ), Reverb and Delay. With both a built-in mic preamp and standard instrument inputs you can choose between using a piezo or pickup system or miking your guitar with a condenser mic. Or why not do both and mix the signals inside G-Natural to get the best of both worlds? G-Natural comes with 30 factory settings optimized for a wide variety of musical genres and playing techniques. The 30 usercustomizable presets allow you to add that crucial personal touch to your sound. G-Natural’s mic pre can also be used for vocal performance. Just put G-Natural in song mode and you automatically get a separate vocal strip EQ and compressor block. Topping an already packed feature list, a built-in tuner, digital I/O, expression pedal input and MIDI make G-Natural the number one multi-effects solution for the serious acoustic guitar player – all you need is a fresh set of strings, a load of killer tunes and you’re good to go.